TThe Crescent resembles a crescent moon but its value does not wane. 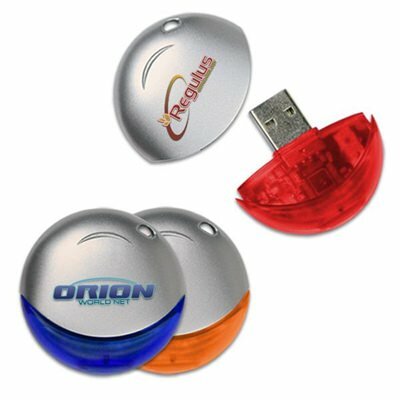 The large imprint area and bright colors make this a popular promotional USB drive for many companies in various specialties. The round shape works well for logos that may not work on other branded drives. Available in blue, red and orange with a silver cap area. Send your sales numbers to the moon with the Crescent. To maximize the power of your promotional dream, consider adding the Crescent to your program. It offers excellent and highly visible print space for your logo or brand name. Customers love having easy access to data storage and so aren’t likely to throw this gem away, thus ensuring a long exposure life span for this drive. Our silkscreen printing will bring out the best in your logo and the clear plastic caps come in tons of fun colors to complement it.